In our house we like to experiment! We like to try things out and see what works best and then come back and share our findings (a few years ago, I experimented with how to make a candle wick.. and shared what I found ? and that went down a treat!). I find it particularly useful to experiment and share results, when the findings are, what I would call inconclusive. When it comes to how to preserve leaves, we found.. well there is no real ?best way?. 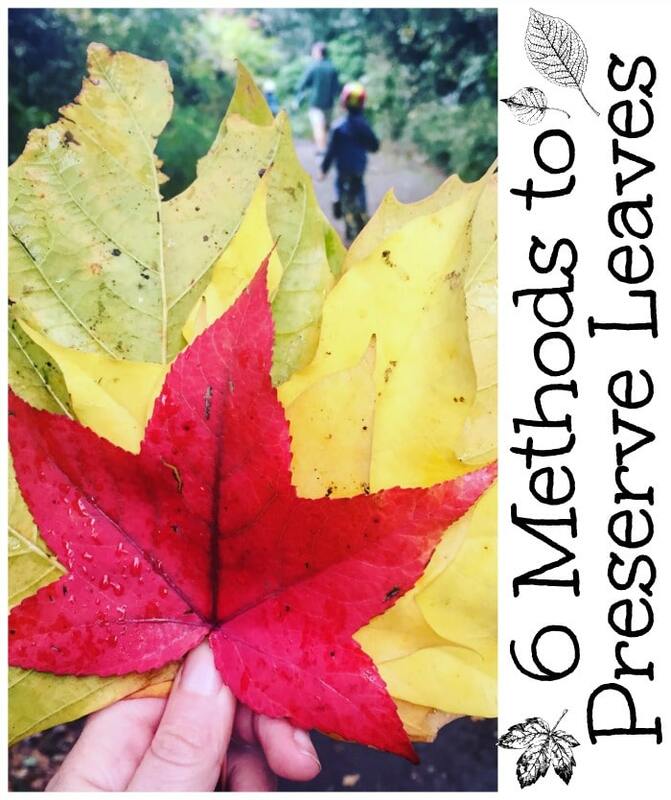 There are lots of different ways to preserve leaves, but none, in my opinion, is best ? for different reasons. But they are all good ways to preserve leaves, again, for different reasons. So I will list the most common leaf preservation methods (I confess, there is one we didn?t try ? which is to wax your leaves, so I can?t compare ALL methods, but I can make an educated guess about the outcome for you). The first thing to note when preserving leaves ? is to SET YOUR EXPECTATIONS. Autumn leaves are stunning and beautiful ? with bright reds and bright yellows. It is incredibly HARD to preserve this brightness ? especially for the reds. So just set your expectations and anticipate that final colours, will be lovely, but not as stunning. In a way, I am happy about that, because that way we appreciate nature year on year even more so. I have created a short video about the Glycering Bath method and compare what the leaves look like to pressed leaves, laminated leaves and PVA leaves at the end (so watch the all of it!). Then BELOW the video, is a list of the different methods + the waxed leaf method, with some advantages and disadvantages highlighted! Pressing leaves is easy and fun classic way to preserve leaves. You make sure your leaves are dry (pat them dry with some kitchen towel), place them between 2 pieces of newspaper and pile on some books. Or get yourself a fancy flower and leaf press! You need a laminator, so not everyone can do this. It is important to make sure you leaves are properly dry! Then feed the leaves through the laminator. My daughter ?simulated? the laminator by taping up her leaves with tape (ha!). It worked surprisingly well. We found that the laminating leaves was great for preserving colour INITIALLY, but that over time the colours would also darken and fade. The glycerin bath method was new to us (and you can watch our video below to see how we did it and what we thought ? in the video, we also show what the ?laminated? leaves, the pressed leaves and the PVA leaves look like in comparison). For a glycerin bath you use 1 part glycerin (from the baking section in the supermarket) and 2 parts water. the leaves are wonderfully subtle and feel ?like real leaves? 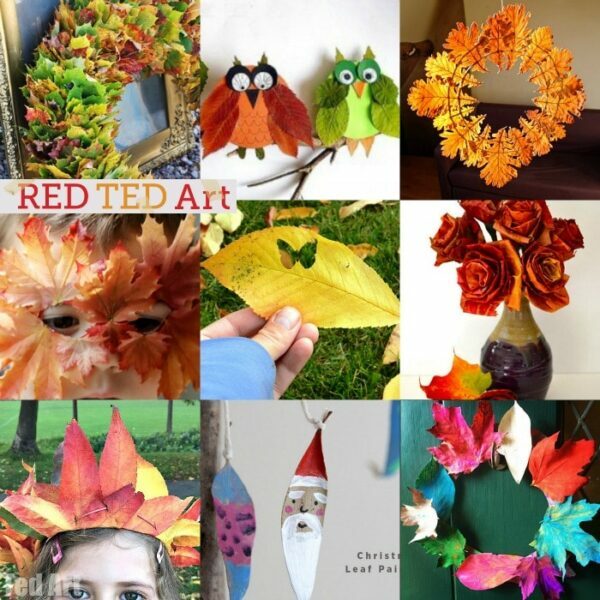 PVA presevered leaves essentially means that you paint your leaves with PVA glue and let dry. This method works well enough, for leaf collage art ? especially if you want it to be 3D, as the leaves will not stick flat (unless you have pressed them first!). Over time, leaves will darken. This is one method, I have NOT done myself. In essence ? you melt down a pot of white left over candle wax and dip your leaves, then hang to dry or place on baking paper to dry. Make sure you leaves are dry and not wet first. anything with molten wax is messy! I can only guess at how well the colours will keep.. but suspect it is like all of the above?. colours will darken over time. Reds will turn into magentas, yellows, will do well, but fade to light browns over time! This is essentially similar to the wax dipped leaves.. but the result is different in that your leave is flattened and the wax layer is much thinner. You will need old fashioned ?waxed paper? ? like that used for wrapping sandwiches ? note: this is hard to find in the UK, but common enough in the US! Take your waxed paper, put some on either side of your leave. Place on newspaper and old tea towels and iron. Take care NOT to get wax on your ironing board or iron! I have to say I feel that I am ?inconclusive? about what the BEST method is ? basically, it is hard to keep those beautiful reds and bright yellows, as the chemical make of these simply changes over time. In future, I would probably opt for ease ? e.g. the pressing of leaves or laminating or PVA gluing depending on the project, over the ?hassle? of glycerin baths? or mess of wax dipping! So? please do leave comments below with your experience of preserving leaves and I can update this post as and when more information is shared! Happy Leaf Crafting!! !